Before 1940 there were only two roads in the Village of Arle, namely Village Road and Hesters Way Lane. Village Road was joined by Arle Road (originally Sandfields) which extended from Gloucester Road to the Village. As you drive along Village Road today, carefully negotiating the bumps, chicanes and roundabouts, you must find it very difficult to picture it when there was little or no traffic apart from the occasional tractor, or pony and trap. It was a time of tranquillity and unhurried pace, green fields, the lowing of cattle and bird song, but times have changed, in Village Road very much so. The plan of G. Coates & Son taken in 1776 (inside front cover) shows that Arle Village Road was then known then as Arle Street. The plan shows the roads leading from Arle Cross to Pillford Lane, running north to south from Bedlam Bridge (near the Cross Hands) to Tanhouse Lane, (now Tanners Lane), with Arle Cross at the present junction with Kingsmead Road. The name of Bedlam dates from the 13th Century when John of Arle gave land to the Hospital of St. Sepulchre and St. Margaret and the Leper Brethren of Gloucester. The Mill was situated on the North bank of the River Chelt in the parish of Swindon but would have served the residents of Arle. At the southern end, Tanhouse Lane was situated on the Lynn Brook (hence the name Brooklyn) and was possibly the home of one of the Gregory family who were tanners in Cheltenham in the early 16th Century. The Gregory family owned or leased most of the land in Arle or Alstone from that date and in 1591 John Gregory of Arle, husbandman, lived in Gregory's farmhouse, later known as Arle Farm (see below). In 1775 John Gregory Welch was born in the Elizabethan Arle Court. He was the son of Mary Gregory and her husband Walter Welch, and later married Frances Asser White, daughter and heiress of Thomas White of Alstone. In 1806 John built Arle House and the couple produced thirteen children. Their grandchildren all married well and the men gained distinction in the Army and Navy. When the last of the family - two sisters, died they left between them nearly �40,000 to Cheltenham Parish Church. Arle House was demolished in 1960 and Arle School (now Kingsmead School) was erected by the site. The present new Arle House is a nursing home. Arle Farm had become the Home Farm in 1806, but in 1879, it was purchased by James Wood and it became Arle Farm Dairy. From 1951 Griffiths & Diamond Motors rented some of the outbuildings, together with a number of other small companies, whilst Mr. & Mrs. Street who lived in the farmhouse, ran a riding school from there. They kept their horses in the field now covered by the George Readings Estate, which on autumn nights, because of its closeness to the Chelt, was often shrouded in mist and it was an eerie experience when walking along Princess Elizabeth Way to hear a curious munching sound and suddenly be confronted with the large form of a horse peering over the fence. Arle Cottages can still be seen, some of which were built 200 years ago as tied cottages for the men who worked on Arle Farm, and their wives, who also worked as dairy maids or domestic servants. The early members of the Welch family of Arle House do not seem to have shown any particular concern for the welfare of the village folk, but Edward Welch (born 1835) who was later a lieutenant in the 93rd Regiment, home on leave from India in 1857, mentions the Old School House in his diary. This stood on the corner of Welch Road. Welch seems to have been instrumental in purchasing books for the children and organising a school dinner at Christmas, enjoyed by adults and children. The village pond, a little further along the road, on what is now the corner of Dill Avenue, was the scene of some excitement when a horse named Lively, belonging to Mr Gershom Wood of Arle Farm, got bogged down in it and after all efforts by the locals to rescue it had failed the fire brigade had to be called. 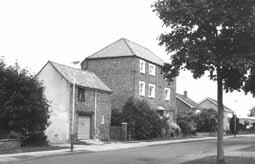 Opposite the school house were Bank Cottages which belonged to 'Jocker' Brown of Arle Court Farm. In a letter to Hesters Way News, Mrs. Herring, who lived with her family in one of the cottages, gave a wonderful insight into life in Arle at the beginning of this century. The road which runs from Princess Elizabeth Way to Village Road is shown as Church Lane on 'Coates Plan of Roads leading from Arle Cross to Pillford Lane' July 1776. Prior to the building of the Estate it was the western end of Arle Road, only to be separated when Princess Elizabeth Way was opened in 1951. In 1967 it was renamed Kingsmead Road. Those who travel it daily may wonder why the tall red-brick, ivy-covered house has been preserved midst the surrounding semi-detached houses. This house is, in fact, a listed building being the remains of Arle Court House. The house was partially demolished in the late 19th Century and the remains were formed into the Arle Court Farmhouse, which you can see today. The farm buildings were erected on the opposite side of the road. Frank Brown, the farmer, known as 'Jocker', was remembered by some when they were children as a rather fearsome figure who chased them from his orchard when they were 'scrumping' apples. Arle Court House is thought to be haunted. When visitors are expected, there is said to be a loud knock on the door, and when answered there is no one there. Mrs. Moot, whose husband was General Manager of Western Estates lived there from the 1960's and had a sewing room on one of the landings on the first floor, and she told me she often felt "a presence" behind her, but when she turned round there was no one there! Arle Mill was nearby, on the site of what was until recently, Booker's Trademarket. It was one of the five mills on the River Chelt mentioned in the Cheltenham Domesday Return, and is mentioned in various documents in later years. The miller baked bread for sale and also offered housewives a service - to cook the Sunday Joint for them! It was still a working mill until the late 19th Century and then became a row of cottages around 1930. These were demolished around 1952 when Cheltenham Borough Council sold the land to British Bakers who built Mother's Pride Bakery on the site. The driveway to Arle Court ran past the mill, through an avenue of elm trees, over what is now George Readings estate, to cross the River Chelt, and on to a small Georgian Lodge House on the Tewkesbury Road which had a fine well in the garden. This house was only demolished in the 1970's. The brickwork of the bridge is still visible. Almost opposite the way to the mill is the majestic chestnut tree, which at one time stood in the garden of Chestnut Tree House. Plans to fell the tree were dropped after much protest but drastic pruning was necessary when double decker buses were scheduled to pass along the road. The tree was said to be at least eighty years old at that time (1965). Previously No. 230 Arle Road, Chestnut Tree House was the home and surgery of Dr. William Watt, and his partners, Dr. Miles and Dr. Wallace. Their name plates were still attached to the gate well into the 1960s. Back in Kingsmead Road, the house called 'The Gables' was built c 1876 (now No. 43) and was the house of the Sindrey family who were market gardeners. There were several similar houses in the area, built when the farm estate was broken up. On the corner of Kingsmead Road and Village Road was Arle Villa, built c 1830, now 'The White House', which belongs to the Tungum Hydraulics Company, and on the opposite side is Yew Tree Cottage, which is shown on the 1776 plan. A Mrs. Voice ran the village Post Office from there, and there were two or three other cottages behind, at right angles to the road. These were demolished in 1963. On the map, "Arle Cross" suggests there may have been a stone cross on the spot in 1776 but no record of one remains, neither does there seem to be any reason for the name of Church Lane. If there was a church in Arle it was in the 12th Century when Simon, Bishop of Worcester consecrated the graveyard there. Maybe a Mr. Church was the tenant of Arle Court in 1776! This lane adjoined Village Road and wound northwest past a sawmill, near Springbank and Hope Farm, past the Rookeries and Hesters Way Farm and Tichborne Villa out to Fiddlers Green. It still follows the old route but much has changed. However, some of the pre-war Bungalows are still there, but Tichborne Cottage is gone and the old Electricity Station now serves as St. Silas Church. Springbank Cottage still exists as it did in the 1930s and a few older bungalows remain, but Springbank is now a large Estate. This Tudor cottage stands at the southern end of Hesters Way. It used to be thatched and was formerly named 'Redgrove Cottage'. It would have been built by a prosperous tradesman, such as a blacksmith or an independent farmer, in the late 1500s.